The Dec. 12 death of San Francisco Mayor Ed Lee from a heart attack has set the city up for another of the periodic battles between liberal Democrats and even more liberal Democrats for control of City Hall. Members of the former group are known as moderates in San Francisco parlance. “The voter coalitions that elect moderates in San Francisco are Chinese voters, white homeowners, older renters, and the 10 Republicans left in town, combined with unions that represent building trades, police officers and firefighters,” political consultant Jim Ross told the San Francisco Chronicle the day after Lee’s death. Progressives dominate every other category of voters, especially young tech workers and social justice activists. 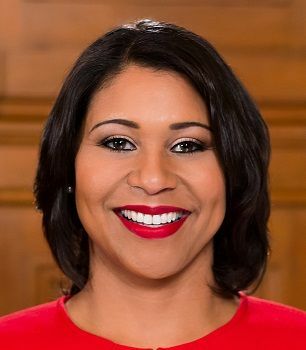 – Acting Mayor London Breed, part of the moderate faction on the city-county Board of Supervisors who shares Lee’s view that dealing with homelessness is the city’s most important issue. Breed, pictured, is the first African-American woman to serve as mayor. There is a possibility that supervisors will name an interim mayor rather than give Breed months to use her authority as both mayor and supervisor to build support for her expected mayoral bid. This could be supported by moderate as well as progressive supervisors in a city full of ambitious politicians. – Supervisor Jane Kim, part of the progressive wing, filed paperwork to run for mayor on Wednesday. Kim lost a state Senate bid to moderate Supervisor Scott Weiner last year. She has won national and international attention for her proposed state “robot tax” assessing fees on companies whose use of robots or algorithms has led to the loss of jobs. The money from the fees would be used for worker retraining and other programs meant to minimize the impact of losing jobs to technology. – State Sen. Mark Leno announced in May that he would run for mayor in 2019 after Lee was termed out. Now he’s running in the June special election, touting his “progressive vision for our city, grounded in a commitment to affordability and civil rights.” A former Assembly member and supervisor, he’s won a reputation as an energetic policy wonk with interest in a wide range of issues, from gender and transgender rights to prison and criminal justice reform to the environment. – Former San Francisco Supervisor Angela Alioto, daughter of former Mayor Joseph Alioto, has taken out papers to run. An attorney specializing in discrimination cases, she cited homelessness as a key issue and said it was crucial to build a coalition with tech firms to address the issue and larger housing concerns. She has deep ties to moderates both through family ties and years in the city’s political trenches. – Assemblyman David Chiu, a former supervisor, faces perhaps the toughest decision of any candidate. If the moderate runs in the June mayoral special election, he can’t seek re-election to the Assembly in November – meaning he’d be giving up the safest of legislative seats with more than eight years until he would face term limits. But Chiu is poised to inherit support from the Chinese American community that was so valuable to Mayor Lee, and he has high name recognition and fundraising clout. Even at 83, former Mayor and former Assembly Speaker Willie Brown remains a key player in San Francisco’s political intrigue. After Mayor Gavin Newsom was elected lieutenant governor in 2010, Brown helped arrange the appointment of Lee – then the city’s chief administrative officer – as interim mayor and gave Lee crucial help in winning a full term in 2011 after Lee broke a promise to progressives to not seek the office. San Francisco progressives fear that moderate Brown will try to execute the same maneuver with Breed, who is considered one of his proteges.